Enter the coupon code and download a copy appropriate to your reading device. 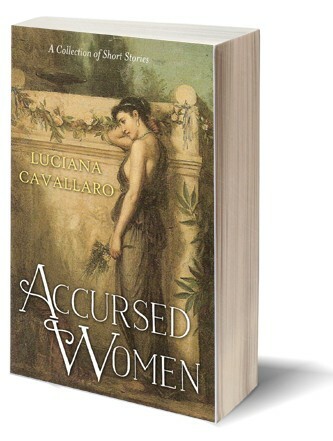 If you like to hold a hardcopy of the book as I do and prefer to buy a print version of Accursed Women, please contact me. I’d be grateful if you share or let others know about the deal. Plus a review would be great! Thanking you in advance. ← Who were the Trojans and where did they come from? Certainly, Luciana, I tweeted this. Sending the post out on Twitter and wishing you so much success on the book (which is next up on my ‘to-read’ list – woohoo!!! I hope you enjoy the stories as well. Thank you Aquileana! Do appreciate the support. I highly recommend ACCURSED WOMEN. One of the reasons I really enjoyed the short stories is 5 myths of women and goddesses are told from the viewpoint of different storytellers which puts a new light on the myth. Gave this 5 stars. Best luck, Luciana, on the release of this book. Worthwhile reading.